In this worksheet, students answer questions using the results of a survey shown in a data table. 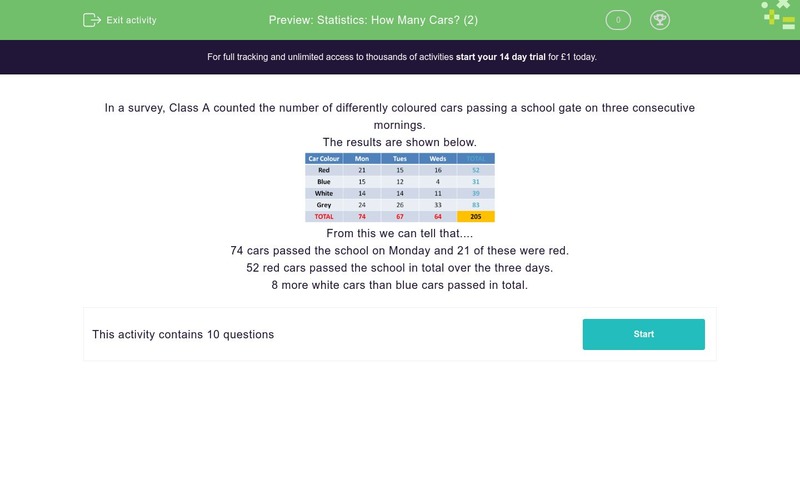 In a survey, Class A counted the number of differently coloured cars passing a school gate on three consecutive mornings. 74 cars passed the school on Monday and 21 of these were red. 52 red cars passed the school in total over the three days. 8 more white cars than blue cars passed in total. Use the table of results to answer the question. Which colour car passed most often on Monday? Which colour car passed most often over the three days? Which colour car passed least often in total? How many cars passed on Tuesday? How many non-white cars passed on Tuesday? How many grey and white cars passed in total over Monday and Tuesday? How many non-red cars passed in total on Wednesday? How many fewer grey cars passed on Monday than on Wednesday? How many more grey cars than red cars passed in total over Monday and Wednesday? Geometry: How Many Right Angles?